Saturn is sinking out of sight toward the setting Sun. The planet's low altitude and the solar glare make it challenging to see after the first week of September. Saturn sets in the beginning of Virgo at 9:00pm and at 7:45pm by its end. As Saturn drifts away from Venus and Mars toward our central luminary, a new sunset triangle forms. The trio consists of Venus, Mars and Spica, the brightest star of Virgo the Virgin. They can be seen to the left of Saturn, our Lord of the Rings. Use binoculars to view and fully appreciate the subtle hues of rouge-gold Mars, bluish Spica and yellowish Saturn. Note: Compare this 8/31 8pm Map with the maps above, to see how the distance between Saturn and the new sunset triangle increases over time, and how the distance between Mars, Venus and Spica decreases. Venus and Spica are closest Tuesday, August 31. Saturn's telescopic rings are tilting open, revealing more and more of their northern face. Generate images of Saturn's ring tilt as seen from Earth with the Solar System Simulator. 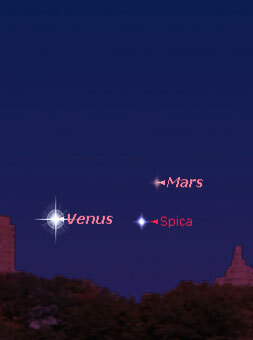 Venus and Mars pair up near Spica, the brightest star of Virgo the Virgin. This new shapeshifting triangle can be seen low on the west-southwest horizon soon after sunset. Venus and Mars, sinking in altitude, set around 9:30pm at the beginning of Virgo and at 8:30pm by its end. Review the 8/23 and 8/29 maps found in the Saturn section above, as well as this 8/31 8pm Map showing Venus and Spica at their closest. 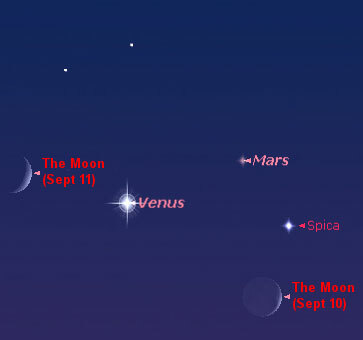 By September 5, as seen above, Spica lies between Mars and Venus, and by September 10-11 Spica lies to their right; the young Moon nearby is an added visual delight. Again, binoculars bring out the best in these sunset performers. With clear skies, an unobstructed horizon, right timing and an optical aid you'll be sure to enjoy the show. Venus is moving closer to Earth growing bigger and brighter, while Mars is moving away and diminishing in size and brightness. Venus pierces the twilit sky and brilliantly blazes in a dark sky until it disappears below the horizon. Venus achieves greatest brilliancy September 23 at magnitude -4.8. 9/23 7:30pm Map Dim Mars at magnitude 1.5 can only be seen as the sky darkens. The star companion of the two planets, blue-white Spica, at magnitude 1.0 is only a little brighter than our Red Planet. Venus has phases like the Moon, which are easily observed with any telescope. You can see them and more in this Venus 2010 Animation. As Venus gets closer to Earth and bigger in disk size its illuminated phase decreases. These changes, distance/disk/phase, are clearly demonstrated in The Phases of Venus animation. During Virgo Venus wanes from a 48%-27% illuminated Crescent. Venus is in inferior conjunction October 28. Venus, Mars and Spica, creating a new shapeshifting sunset triangle in the constellation of Virgo the Virgin, are also shapeshifting humanity. Though these celestial bodies sink below the western horizon not long after sunset, they shine down upon us during the daylight hours affecting our daily activities. These two planets and brightest star of Virgo are brewing an evolutionary elixir within the Virgin's celestial chalice and therefore within humanity. As above so below. Compare Spica's position in the August maps above to the September maps above. Spica, symbolizing the sacred womb of the Virgin's heavenly Holy Grail, accepts and nourishes the seed of Arcturus, the savior avatar. This seed of divinity, residing in Virgo and therefore within humanity, contains the life force of the Big Dipper's 7 Rishis. Helpful Star Map Spica nourishes and protects these energies until spiritual birth can occur. During the sign of Virgo (8/22-9/22) Spica also synthesizes the female energies of Venus and the male energies of Mars with each other and with these 7 great streams of force, the qualities of Deity. To understand this is to recognize that each and every one of us is experiencing some level of this synthesis within our being. As this potent potion percolates, the passionate driving will of Mars the warrior is unifying/cooperating with the understanding creative wisdom of Venus the goddess of Love; both are being imbued with divine qualities from on High, and the hidden essential divinity of humanity is purposefully being midwived into manifestation. Saturn now residing near the neck of the Virgin is also influencing this spiritual birthing process. Saturn positioned anywhere in Virgo the Virgin conceives the structures that exteriorize the unfolding Christ consciousness. During the sign of Virgo the Virgin (8/22-9/22), a divine re-union between humankind's male and female energies and the inner spirit and outer form is taking place in both the constellation of Virgo and within our being. Our innate divinity, accentuated now by the interaction Venus, Mars and Spica, is awakening and also coming into manifestation. Drink of the Virgin's evolutionary elixir and potent potion. Shapeshift from Homo sapien to Homo luminous! Learn more about Venus and Mars above. The giant stormy planet Jupiter is catching our attention these days. These are not ordinary times for Jupiter. For the third time in only 13 months amateur astronomers have detected signs of impact on the planet. 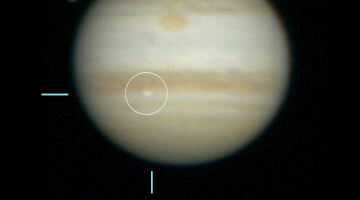 You can learn about the most recent one shown above by clicking Fireball on Jupiter. The earlier events occured on July 19, 2009, and June 3, 2010. This impact frequency has not been noted before. A global network of researchers and amateur astronomers are now monitoring Jupiter with their telescopic eyes!. The image above not only reveals Jupiter's most recent fireball impact, it also shows Jupiter with a missing stripe, the SEB [South Equatorial Belt], which disappeared in May 2010! See Jupiter Loses a Stripe! for a "Before and After" photo and to learn more. In addition Jupiter is at its very best for 2010 during September, reaching opposition September 21, when it is seen from sunset to sunrise. At this opposition the planet lies closer to Earth than it has in 47 years, resulting in its appearance being bigger and brighter than it has been in a long time! Jupiter is at peak visablity for 2010 in September. The planet rises in the east at the beginning of Virgo at 9:00pm and by its end at 7:00pm. It travels high above the southern horizon as the night progresses, sinking low in the west around sunrise. Jupiter is the brightest point of light in the morning sky and in the evening sky after Venus sets. August 24-27 large Luna is a delight near Jupiter. 8/24-27 9:30pm Sky Chart August 26 waning Gibbous Luna and Jupiter are at their closest approach. 8/26 11:30pm Map Click Moon Dances for meditative reflections and an additional sky map. Jupiter lies in the dim constellation of Pisces and pairs up with Uranus, which at magnitude 5.7 is now easily seen with binoculars and without an optical aid in a dark sky. Jupiter's retrograde motion 7/23-11/17 is moving it westward, back toward Uranus. Uranus and Jupiter are in exact conjunction September 18 at 6:07pm (01:07 UT 9/19). As a result, Uranus reaches opposition just 5 hours after Jupiter, so both planets are at peak visablity all night long September 21. Viewing Jupiter with a telescope promises to be an adventure. Any size telescope will reveal Jupiter's missing South Equatorial Belt or perhaps the "SEB Revival" ... the night the stripe returns! In addition seeing nearby Uranus with a telescope or binoculars is a special 2-for-one planetary treat! Both planets, growing in size as they near Earth, also lend themselves to better observations. The four Galilean Moons, the largest and brightest satellites of Jupiter can be seen in a dark country sky with binoculars. They appear starlike on either side of the planet. 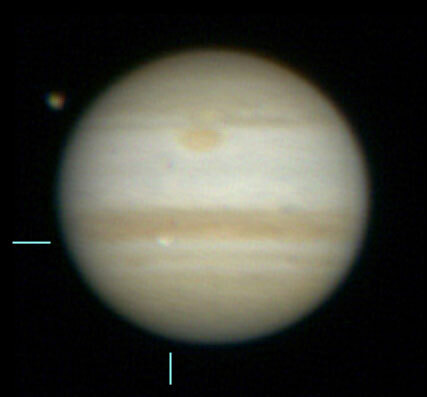 With a telescope you just might see one of these cast a shadow on the Jovian cloud tops. It’s with good reason that the ancients regarded Mercury as the god of thieves. Like a thief, this world hides behind obstructions, such as trees or buildings. Timing is essential for catching Mercury. If you look too soon, Mercury will still lurk beneath the horizon. If you look too late, it’ll disappear in the sun’s glare. Try looking 75 minutes to 45 minutes before sunrise. 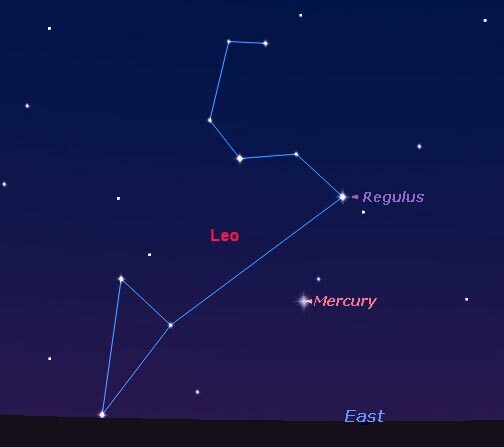 If you’re up before dawn, use the bright star Regulus as your guide to Mercury. This star rises some 40 to 45 minutes before Mercury does. Mercury, as it switches from the evening to the morning sky, is hidden from our view by the bright light of the Sun. This elusive planet reappears above the sunrise horizon around mid-September. Begin looking in the east before dawn as early as September 13. Mercury rises in the east around 5:30am and remains close to the horizon until sunrise. The planet positioned below Regulus, the heart star of Leo the Lion, brightens with each new day. However, after achieving greatest elongation September 19, it begins to sink back toward the Sun. When Mercury begins to leave the evening sky it appears to move backwards among the stars, to the west instead of to the east. This westerly motion is called a retrograde. Mercury is retrograde August 20 - September 12. When leaving the evening sky, Mercury sinks into the light of the Sun and exactly conjoins the Sun in inferior conjunction September 3. This conjunction marks the planet's transition from the evening to the morning sky and the mid-point of its retrograde. The planet ascends out of the solar glare and reappears in the morning sky in mid-September. Mercury halts its 21-day retrograde motion September 12 when it is stationary direct at 4:09pm PDT (23:09 UT). During this time Mercury the messenger of the gods and Leo the Lion are requiring that we re-evaluate our relationship with the soul, the Will and Power of essential divinity. Review map above to see Mercury and Leo the Lion. Sol Crosses the Celestial Equator for Some Southern Exposure! The Autumn Equinox in the northern hemisphere occurs Wednesday, September 22, at 8:09pm PDT (03:09 UT 9/23), when the Sun enters the sign of Libra. It is one of the two days of the year that the Sun moves across the celestial equator. The Sun "falls" below the celestial equator. The true equinox cannot be observed. The Sun transits the celestial sphere signaling the seasons. Auroras increase around the autumn equinox. The world participates in global meditations. Mercury, as it switches from the evening to the morning sky, is hidden from our view by the bright light of the Sun. This elusive planet is in inferior conjunction 9/3 and reappears above the sunrise horizon around mid-September. Begin looking in the east before dawn as early as 9/13. The planet brightens with each new day and is at its best the morning of 9/19 when it is at greatest elongation and positioned below Regulus, the heart star of Leo the Lion. 9/19 Dawn Map Afterwards Mercury sinks back toward the Sun. Mercury rises in the east around 5:30am and remains close to the horizon until sunrise. Mercury is retrograde 8/20-9/12. Saturn is sinking toward the setting Sun and is challenging to see after the first week of September. The planet sets in the beginning of Virgo at 9:00pm and at 7:45pm by its end. 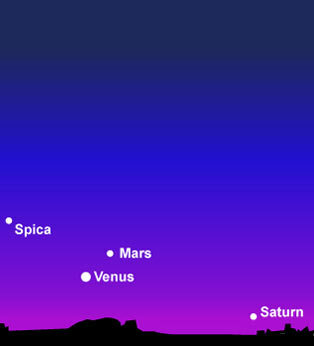 Venus, Mars and Spica, the brightest star of Virgo the Virgin, lie to the left of Saturn. Saturn and Spica are equally bright at magnitude 1.0. 8/23 Dusk Map ~ 8/31 8pm Map Saturn's telescopic rings are tilting open, revealing more and more of their northern face. Generate images of Saturn's ring tilt as seen from Earth with the Solar System Simulator. Venus and Mars pair up near Spica, the brightest star of Virgo the Virgin. Look low on the west-southwest horizon soon after sunset. Both planets are sinking in altitude, setting around 9:30pm at the beginning of Virgo and at 8:30pm by its end. Venus is moving closer to Earth growing bigger and brighter, while Mars is moving away and diminishing in size and brightness. Venus at magnitude -4.7 pierces the twilit sky and brilliantly blazes in a dark sky until it disappears below the horizon. Dim Mars at magnitude 1.5 can only be seen as the sky darkens. The planets' star companion, blue-white Spica, at magnitude 1.0 is only a little brighter than our Red Planet. 8/23 both Venus and Mars lie between Saturn and Spica. Binoculars make vivid the hues of rouge-gold Mars, bluish Spica and yellowish Saturn. 8/23 Dusk Map 8/31 Venus moves further left of Mars below Spica; Saturn now lies to their far right. 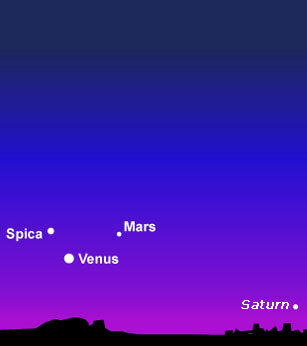 8/31 8pm Map 9/5 Mars lies above Spica with Venus to their left. 9/5 8pm Map 9/10+11 the young Moon joins the 2 planets and star; get out those binoculars to fully enjoy the show; challenging to see Saturn lies to their far left. 9/10+11 Map 7:45pm Venus is at its greatest brilliancy 9/23. 9/23 7:30pm Map Venus has phases like the Moon; you can see them and more in this Venus 2010 Animation. As Venus gets closer to Earth and bigger in disk size its illuminated phase decreases; during Virgo Venus wanes from a 48%-27% illuminated Crescent. You can see this demonstrated in APOD's animation of the phases of Venus. Jupiter is at its very best for 2010 during September, reaching opposition 9/21, when it is seen from sunset to sunrise. At this opposition the planet lies closer to Earth than it has in 47 years, resulting in its appearance being bigger and brighter than it has been in a long time. Jupiter rises in the east at the beginning of Virgo at 9:00pm and by its end at 7:00pm. The planet travels high above the southern horizon as the night progresses, sinking low in the west around sunrise. Jupiter at magnitude -2.9 is the brightest point of light in the morning sky and in the evening sky after Venus sets. During Virgo, in the dim constellation of Pisces, Jupiter pairs up with Uranus, which at magnitude 5.7 is now easily seen with binoculars and without an optical aid in a dark sky. Uranus and Jupiter are in exact conjunction Sept. 18/19; 9/21 Uranus reaches opposition 5 hours after Jupiter. 8/26 look for the waning Gibbous Moon near Jupiter. 8/26 11:30pm Map 9/23 there's an encore performance with the Harvest Full Moon near Jupiter. 9/23 9pm Map Jupiter is retrograde 7/23-11/17. The Big Dipper is in the northwest arcing to bright golden Arcturus in the west, at nightfall. Summer Stars How many summer evening stars can you find using spring's Big Dipper Navigation? Notice the seasonal position of the Big Dipper's bowl. Scorpius the cosmic scorpion, a sprawling j-shaped constellation, is seen in the southwest at sunset. Antares is the red heart star of Scorpius. With binoculars on a moonless night can you find the Scorpion's missing claws (now the constellation Libra), its two stinger stars sometimes called cat's eyes or how about the star clusters M6 and M7 above the Scorpion's stinger? These Maps/Text from 2008 are helpful. Throughout the year you can Track Bunny's Footprints in Scorpius! The Milky Way appears like a faint cloud extending from Scorpius on the southwestern horizon, to the Summer Triangle high overhead, and onward toward Cassiopeia (M or W shaped) on the northeastern horizon. Star Map.